Here is a simple wooden test frame that I constructed in order to apply several different finishes to some ordinary uncertified 1.7 oz. fabric to get an idea of how much weight the different finishes might add to a typical Pietenpol Aircamper. The frame was built from some scrap 1x4 material that I salvaged from a shipping crate, but turned out to be just about the right size to allow me to cut out four, 2'x2' square test swatches. All four test coupons are heat-tautened as per the Poly-Fiber manual. One is weighed in unfinished form to provide the "tare weight" to be deducted from the other three and thus give some idea of the weight added by the finishes. The second is finished through Poly-Spray ("silver") to simulate those surfaces such as wings and tail feathers that are often used in silver on Piets with simple paint schemes. This finish provides UV protection without the weight of a color coat. The third panel is the same as the second but then receives color coats of Poly-Tone over the Poly-Spray. The final panel has no Poly-Fiber finishes applied whatsoever, but is instead finished using a top quality exterior latex house paint. All finishes are applied using the same hardware-store bristle brush, although foam brushes, rollers, and spray techniques could also have been used and would probably have produced different thicknesses of finish. This test was intended to provide relative differences between the finishes, NOT absolute values of weight added by any one finish although my brush method should be useful as an approximation of what a typical paint job will add to the bare covered airplane. Samples are allowed to air-dry cure for 7 days but may continue to out-gas a small amount beyond that time. Most builders' patience is about like mine and will not allow that much time to pass between coats or steps in the finishing process. I'm basing my work on the experiences and testing of several other builders and experimenters. 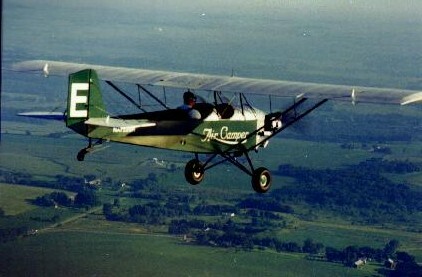 For one, Steve Eldredge in Utah finished and flew his Piet for years with the airplane wearing latex paint applied in the common way (flat black house paint to block UV, then color coats over that). The finish has been durable, affordable, and easy to touch up. Rick Holland in Colorado conducted an outdoor weathering test of latex house paint, the results of which are at Rick Holland's Paint Weathering Test and which demonstrate that latex house paint provides excellent UV protection over the long haul as proven by fabric penetration tests. Kirk Huizenga conducted instrumented UV transmission tests of Poly-Spray vs. latex paint, the results of which are available beginning on Page 5 of the March, 2003 EAA Chapter 54 Newsletter . What has been debated without quantitative analysis is the difference in weight for the various finishes. My test is designed to provide approximate weights for the various finishes although I will also be subjecting my test coupons to a 12-month outdoor weathering/endurance test with fabric punch testing every 3 months during the weathering test duration. Here's the frame with fabric applied to all four panels. The method of attachment is Poly-Fiber's "Poly-Tak" cement. I applied an additional brush pass of "Poly-Brush" to soften the adhesive and allow it to come up through the weave to secure the fabric to the frame. In this test, none of the fastening matters because the test coupons are cut away well clear of the line of adhesive. 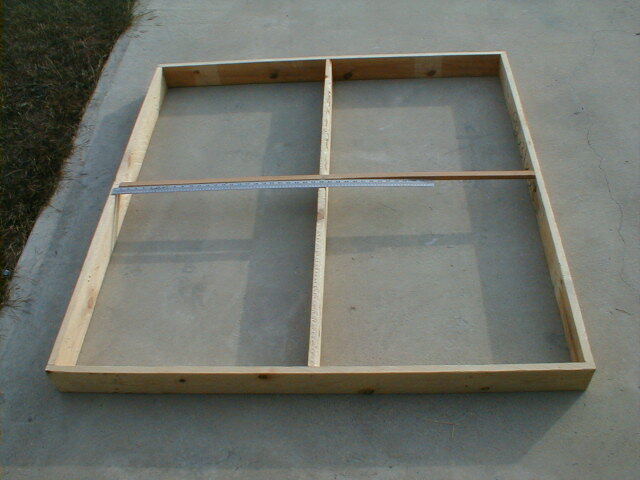 The frame provides four, 4 sq. ft. coupons (as nearly as I can mark and cut them out of the frames). These are large enough to be statistically significant when working with the small values of mass added by the finishes. There have been various values used for the total quantity of fabric used to cover a typical Air Camper. A common quantity used by experienced builders seems to be about 38 yds. of fabric. The fabric comes in 60" width, thus 38 yds. provides a total of 570 sq. ft. of fabric for the complete airplane. The mass quantities of finishes applied to my test coupons of 4 sq. ft. are then multiplied by 142.5 to scale them up to arrive at a total estimate for the completed airplane. Test frame with all finishes applied. 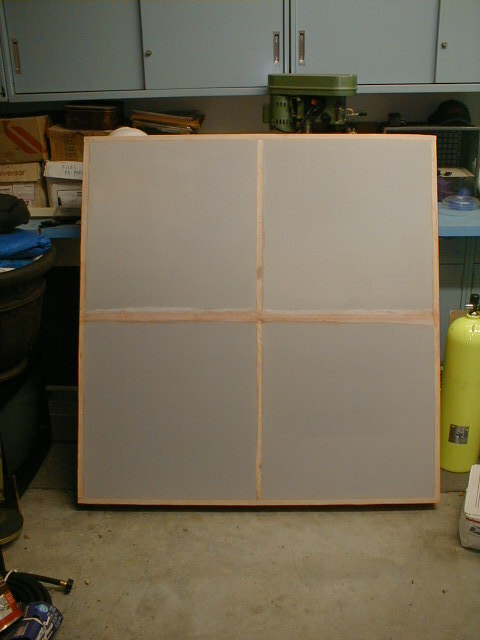 Again, one panel is left unfinished to provide the tare weight. One panel has the Poly-Fiber recommended three cross-coats of Poly-Brush and three cross-coats of Poly-Spray. 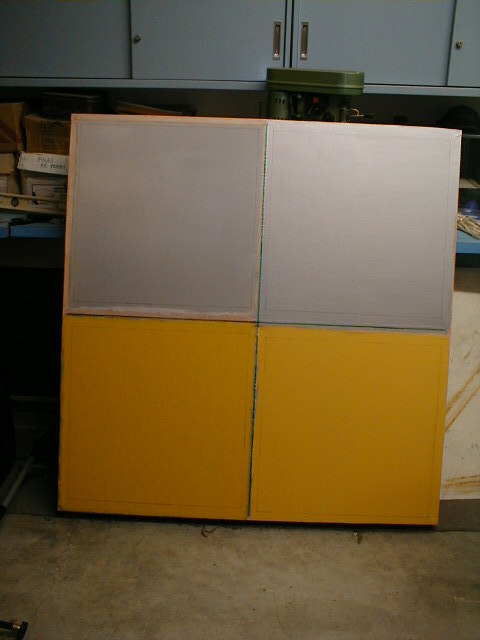 The third (lower left) is the same as the second but also has a brush coat of Poly-Tone final color, "sufficient to cover" as per the Poly-Fiber manual (one wet cross-coat and a final light coat after that dried proved to be fairly adequate, although yellow is one of the most difficult colors to get bright color with the silver behind it). The fourth panel has the latex house paint finish. 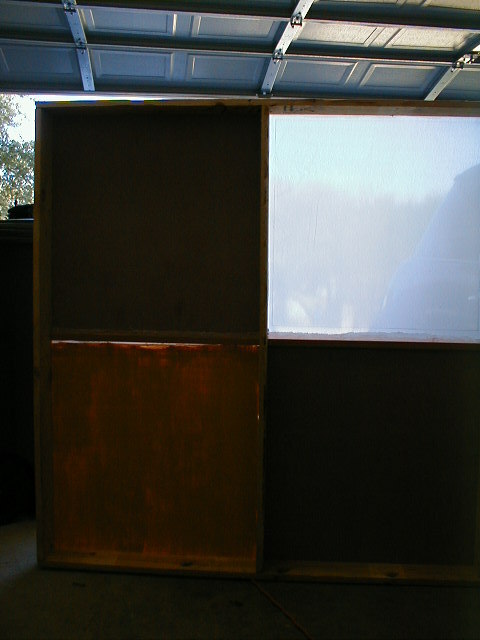 Although the latex paint said that one heavy wet coat would provide complete cover and UV protection, I elected to apply the first coat as a thinned one to allow the paint to flow down into the weave of the fabric for mechanical attachment as would be the case on an airplane, and a second full-thickness coat (applied across the first) as the final color coat. I did NOT apply flat black latex paint as called for in the traditional method, following Kirk Huizenga's findings in the UV transmission test and the latex paint manufacturer's assurances. After applying the first coat (thinned 4:1 with filtered water) and waiting about 45 minutes, I checked the back of the test panel and it was still quite wet, although not to the point of dripping. I have no doubt that the latex soaked very well into the weave to provide the mechanical bond. The latex paint, thinned or not, dries much more slowly than any of the solvent-based Poly-Fiber coatings. Which latex paint to use??? I did considerable research before I selected the latex to use for this test. In the end, I decided to think like a Pietenpol homebuilder and based my decision on what I would actually use if I were painting my airplane with latex. 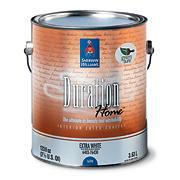 Almost all the reviews online and in the consumer magazines pegged the Sherwin-Williams "Duration" ($50/gal.) as the top pick, with the Sherwin-Williams "SuperPaint" ($42/gal.) second. On most of the homebuilder sites where latex use is documented, including Steve Eldredge's, the paint used was Sherwin-Williams. However, I looked at the 3rd most capable paint in most surveys... Valspar's "Ultra Premium" ($25/gal.) for several reasons. First, Consumer Reports rated it quite high in their testing, which simulated 9 years' continuous outdoor exposure and included testing for staining, chalking, mildew, fading, and other weathering properties. My airplane is always hangared so it will never see more than a few hours of weathering at a time, and then mostly in dry, favorable conditions. I think a paint job would last 10-15 years under those conditions, if not more. The reviews listed the Valspar as a very solid value and it has a lifetime guarantee from the manufacturer [however, I would assume that there would be NO hope of ever having Valspar hold to their guarantee if it's used on airplanes! ]- and one-coat coverage. The other main reason I chose the Valspar was that it is available at Lowe's, which means I can get more paint very easily. I am never more than 20 minutes from a Lowe's here in San Antonio and they are open every day. The paint is available in flat, satin, and semi-gloss finishes and comes in single gallons or 5-gallon pails. It can be mixed in a wide range of colors, but when I took in a swatch of the "Insignia Yellow" Poly-Tone that I used on the adjacent test coupon the match was close but nowhere near exact, even after a couple of valiant attempts at tweaking it. I was a bit surprised because Insignia Yellow is used almost universally on road striping and road signs and is widely available in industrial paints. However, the color match is quite good and certainly not involved in the main objective of this test. Frugality and practicality are hallmarks of the Pietenpol and its builders. With Poly-Tone at over $75/gal., any latex paint will be a relative bargain but there is nothing wrong with using a good product at a good price. I did not go with the cheapest paint out there. The test coupons were cut out of the frame after measuring 24" squares as carefully as possible with steel square and Sharpie. The coupons were then rolled into tubes to allow weighing. The bare, stretched dacron equates to a weight of 7.7 lbs. of dacron for the estimated 570 sq. ft. of fabric to cover an average Air Camper (not including tapes, stitching, doilies, etc. etc.) and this was the tare weight that was deducted from the weights of the other three coupons to derive the weight of the finishes. Finishing the fabric through Poly-Spray ("silver") added a calculated 16.87 lbs. to the estimated total of an Air Camper and is considered the minimum finish for the Poly-Fiber cover method. Finishing the fabric through Poly-Tone ("color") added a calculated 26.45 lbs. to the estimated total of an Air Camper and is the basis for my comparison to latex paint. Finishing the fabric with exterior latex house paint added a calculated 14.83 lbs. to the estimated total of an Air Camper and came as quite a surprise since I had always heard that latex paint would add excess weight over an equivalent conventional cover finish. However, read on. Looking through the back of the test frame one can see that while the two Poly-Fiber panels (both with silver) pass zero light, the latex finished panel has quite a bit of light showing through. True, my brush application method resulted in strokes and streaks, but it is my opinion that rather than a single coat over the thinned "grip" coat, a second coat or a heavy cross-coat should be considered the minimum application of latex needed. If visible light is seen to pass through the paint coat, surely UV is passing through as well. However, at worst with two coats of latex over the thinned grip coat, the weight of the latex finish will be quite close to that of conventional Poly-Fiber. I'm convinced that weight is no longer an issue when considering the use of latex house paint for airplane finishes. The test coupons will undergo a 12-month exposure test on the southern exposure of a South Texas building on a hillside. It is, in my opinion, quite a severe test. Results will be posted here as they become available.